Ok small business owners - listen up! To be successful in business, you need to have great systems in place. And the key to a great system is a great tool. Enter Evernote*! I'll be honest - systems and organization are areas where I used to REALLY struggle. If I'm being transparent, I didn't think that being organized was really all that important. And then I got convicted. (No, not sent to jail convicted - internally convicted). I was reading a passage in Matthew 25:14-30 - the parable of the talents. One of the points of this parable is that we have to be faithful with what the Lord has given us. And this resonated with me in business, too. By not being organized and by not having systems, how could I truly expect to scale my business? How could I expect even more if I wasn't faithful with what I had been given? I knew I needed a system, but I had a terrible time figuring out a system that worked for me. I first tried using paper and pen, but I started having trouble finding my notes and couldn't remember to bring my planner/binder with me. I tried using spreadsheets and Google Documents, but I couldn't read everything on my small phone. And then, my life was changed! I found Evernote*. I started off with the free version but quickly upgraded to the Premium version (at the time, it was $50/year and they had a six month bonus, making my cost per month less than a cup of coffee at Starbucks - 100% worth every penny). 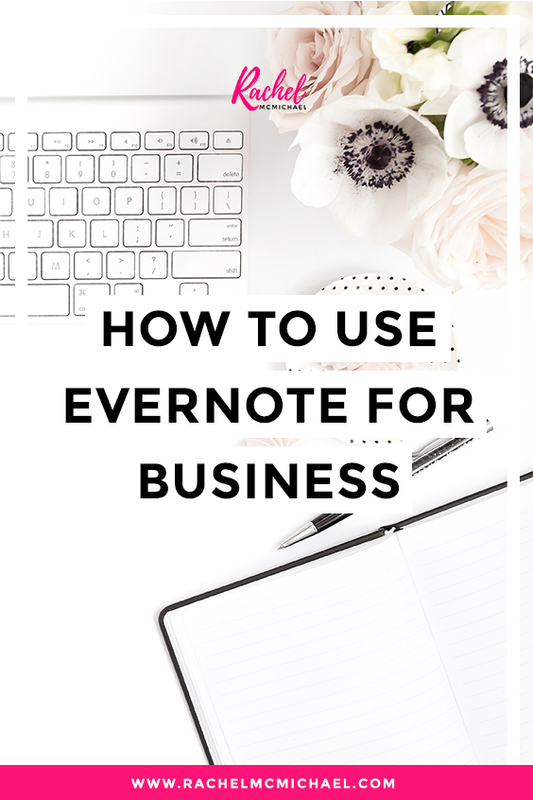 So how do I use Evernote for business? Let me give you the thousand-foot version here. And if you want the more detailed version (including step by step instructions), you can always check out my Business Building Blocks Training Course. If you've read my article about brain dumping or my time management tips for work at home moms, you know how strongly I feel about the importance of a to-do list. In Evernote, I keep a draft to-do list that includes all of my daily and weekly tasks. Each week, I create my current week's to-do list from that template, title it with the current week's date, and pin it to the Shortcuts tab. Voila! I now have a starting point for my brain dump and an actionable list to work from during the day. And since Evernote syncs with my iPhone, my computer, and the internet, I can access it anywhere! Following up is a critical element in every business. And without a good system for follow-ups, these can be incredibly time consuming. Evernote has literally saved me hours every day when it comes to following up with clients and prospects. Here's how (it's so simple! ): I create a note for each client and each prospect that includes detailed information. If you've ever applied to one of my online bootcamps or my business mentorship program, you have a note in my files! Within each note, I house basic contact information, notes from emails and phone consults, etc. I also use the reminder feature within Evernote to remind me when it's time to follow-up. And Evernote emails me a daily summary of these reminders, too! I no longer waste time in my inbox and sent mail trying to sort through where I'm at in the process with any given individual. Through a series of unique tags and identifiers, I'm able to quickly and easily tell where I'm at in the process with everyone on my list! Some of the most common questions from my mentorship clients are related to systems. I house each of my systems in Evernote. In fact, I have a different notebook for every launch, every course, and every product I offer. From lead generation to the final course email, it's all housed in Evernote files. Why? Because I learned a long time ago that the best way to know how to improve is to write, assess, reflect, and update. So now, I write out each system. At the end of a project, I assess how it went, reflect on any changes that might need to be made, and update my system for next time. My courses are constantly evolving and I'm constantly trying new things. And because I have a system in place for everything, I don't waste hours and hours trying to determine where I'm at in the process or trying to remember what comes next. And it's much easier to transition of several of these tasks to my assistant since they have become duplicatable. Do you have a system you use for staying organized? Have you plugged into Evernote yet? What's your favorite use for this amazing platform?